Property 9: Detached house for 2 people on land owner. 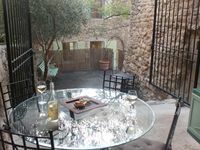 Property 27: Lodging "Opposed the Sorgues"
House for rent in Provence for 4 persons with large pool. Property 32: House for rent in Provence for 4 persons with large pool. Property 35: Provence, its lavender, the song of cicadas, the sun..Let yourself seduce ..
We had a lovely stay here. We were doing a drive around Provence (a la Rick Steves), and this was a great stop for us between the Luberon and the Cotes Du Rhone. This was a good home base for us for both these areas. The pool is gorgeous with views of the village and Mt. Ventoux. The rental unit itself was clean and comfortable. There were only two of us, so we had lots of space. The kitchen was well set up and had everything we needed. We also enjoyed sitting out in the back yard and looking up at the stars (we could see many more than we have at home). The outdoor table was nice for breakfast. Overall, this place was excellent, and we really enjoyed our time there. We loved our stay in Penelope&rsquo;s home! The small town of Lagnes was nice to be in for its peace and lack of tourists. Yet it was charming and nice to walk around and up onto the hill above it for pretty sunset views above the rooftops. We dined at the restaurant in town and also the pizzeria, both of which are great. The home itself is cheerful and inviting. The color schemes were so lovely and the decor embraced the local charm. The beds and pillows were comfortable and we all slept well. We especially loved the terraces. The home is central to many towns and fun things to see. A good grocery store is ten minutes away in L&rsquo;Isle-sur-la-Sorgue. There&rsquo;s also an ATM at this grocery store too. Most towns we saw were between 10 and 30 minutes away. Our favorite was Gordes. We would highly recommend this home and host to others and enjoyed our stay! *A helpful tip for your arrival would be to put the restaurant Auberge de Lagnes into your GPS. There is a parking lot across the street from it that always had parking. It&rsquo;s not too far to the house from there and this way you avoid any extreme narrow roads or confusion when parking.